We pride ourselves in the environment in which we work and treat our patients. We have lots of friendly staff who are there to help without long queues. Please talk to any of our Reception Team to help sort out any problems. We have Medicare Easyclaim facilities to allow you to claim your Medicare rebate immediately. EFTPOS facilities are available and we accept most cards except Diners, Amex and Bartercard. We have a fantastic team of Nurses who are here to help. Our Nurses are able to help triage and prioritise urgent and emergency cases. They can give telephone and face-to-face advice. Having more than one Nurse ensure Vaccines are given simultaneously to avoid unnecessary discomfort. Please call and ask to speak to our Nurses anytime on 55477733. We understand you don’t always need another consultation to gain your results. Our Nurses are able to provide your results by telephone provided we can be confident with your identity. Confidentiality and privacy laws prevent us giving results to another person unless consent as been given prior. Parents, please understand this may include giving results to parents of ‘minors’ as laws protect their confidentiality in many situations. Please remember, it is not the responsibility of the Nurse to interpret your results. Interpretation and advice on abnormal results would usually require a follow-up consultation. Our Nurses are busy. To assist them we do prefer you call between 12:00MD and 1:00PM to gain your results. We understand this may not always be possible and will try to help at other times. We have convenient parking directly in front of our practice. Disabled spots are included. An undercover park is located a short stroll away. There are no stairs and disabled access is excellent. 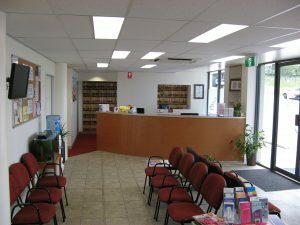 We have a large spacious waiting room which generally means you will be able to wait comfortably without feeling crowded. We provide a fenced children’s areas to assist keeping your children happy and amused, whilst ensuring they do not disturb unwell patients. If you are particularly unwell, please talk to reception staff and we will move you to a quiet area with a bed to lie down if necessary. We provide a disabled access toilet with Baby change facilities for your comfort. Ask Reception for a key. We pride ourselves in the large well appointed treatment room in our practice. Many of our patients say it “looks more like an Emergency Department that a doctors surgery”! We have 2 emergency beds with full resuscitation equipment. We provide Oxygen, Suction, Cardiograph, Spirometry, Defibrillator, Intravenous resuscitation, Airway control, Vaccination, Injections, Dressings, Advice and more. We also have a dedicated room for our Wave Brilliance Incontinence Chair. Our Procedure room is like a mini surgical theatre. Well appointed with ensured privacy. 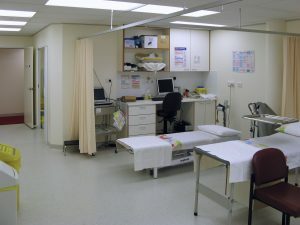 We have 8 Doctors consulting rooms. All are spacious and comfortable. 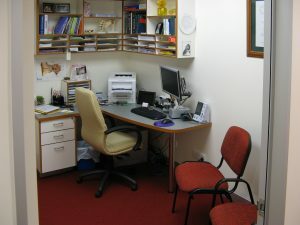 A separate Nurse Consulting room allows private consultations with our Chronic Disease Management nurses. 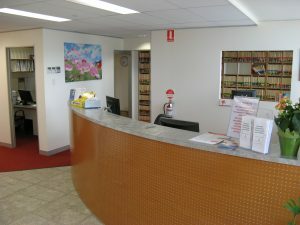 QML pathology are conveniently located adjacent to the waiting room area.